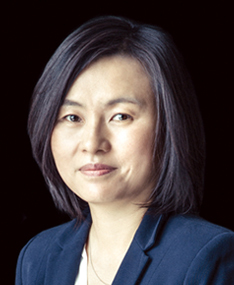 Dr. Hee Oh is a world-leading expert in homogeneous dynamics, discrete subgroups of Lie groups, and its applications to geometry and number theory. A rare mathematician with expertise in all of ergodic, algebraic and analytic aspects of discrete subgroups of Lie groups, she combined them to develop innovative methods to solve many long standing problems in geometry and number theory. One of her major achievements is the beautiful work on Apollonian circle packings, which originated from a theorem proven by the ancient Greek geometer Apollonius that given any three tangent circles in the plane, there are exactly two more circles that are tangent to all three. By iteratively drawing the circles described by this theorem, one obtains a striking pattern in the plane, which is one of the first known constructions of fractals. Dr. Oh’s work explores the relation between the geometry of such packings and their density. More precisely, it describes the asymptotic number and distribution of circles of bounded curvature within a given region of the plane. This result is a technical tour de force and involves a remarkable interplay of ideas from group theory, measure theory, and hyperbolic geometry. Her work is expected to be of value in interpreting the structure of fractals in nature. She has made many other fundamental contributions, ranging from the study of orbits of thin groups arising in Diophantine problems, to equidistribution of rational solutions of Diophantine equations, to geometric analogues of the prime number theorem, to geodesic planes in hyperbolic 3-manifolds. In particular her collaborative work on the Diophantine analysis of thin groups offers a profound understanding on Zaremba’s conjecture, and the result on planes in hyperbolic 3-manifolds is the first topological rigidity theorem for planes in the infinite volume hyperbolic 3-manifolds.